Washington (CNN) A bipartisan group of senators is opposing President Donald Trump’s pick to head NASA, arguing he is a political appointee who doesn’t have the necessary experience to run the agency. Florida Sens. Marco Rubio, a Republican, and Bill Nelson, a Democrat and former astronaut, both oppose Trump’s nomination of Jim Bridenstine — a current GOP congressman from Oklahoma and former Navy aviator. Both senators said they worried that Bridenstine would bring political baggage and that his lack of formal science education would hold up the nomination process for a key appointment. Bridenstine graduated from Rice University with majors in economics, psychology and business and has an MBA from Cornell. After serving in the military, he worked a four-year stint as executive director of the Tulsa Air and Space Museum & Planetarium. Nelson said in a statement: “The head of NASA ought to be a space professional, not a politician.” Nelson is the ranking member on the Senate committee on commerce, science and transportation and would vote on Bridenstine’s confirmation. Ohio Democratic Sen. Sherrod Brown expressed concern over Bridenstine’s history of climate denial and condemned his pick in a campaign fundraiser email sent Tuesday evening. “He has consistently been one of NASA’s strongest advocates in Congress. Due to his efforts, in 2015 SpaceNews named Bridenstine one of ‘5 Space Leaders Making a Difference. '” He is also the former executive director of the Tulsa Air and Space Museum Planetarium,” Fetalvo told CNN in a statement. NASA’s acting Administrator Robert Lightfoot, said he was “pleased” by the nomination. “I am pleased to have Rep. Bridenstine nominated to lead our team. Of course, the nomination must go through the Senate confirmation process, but I look forward to ensuring a smooth transition and sharing the great work the NASA team is doing,” he said in a statement. Bridenstine’s office did not respond to requests for comment from CNN. NASA conducts research and publishes reports on the Earth’s changing climate, monitoring weather patterns with American satellites. Yet Bridenstine has a documented history of questioning the science behind climate change. Speaking on the House floor in 2013 Bridenstine incorrectly said that global temperatures stopped rising 10 years earlier. “Mr. Speaker, global temperatures stopped rising 10 years ago. Global temperature changes, when they exist, correlate with sun output and ocean cycles. During the Medieval Warm Period from 800 to 1300 AD — long before cars, power plants, or the Industrial Revolution — temperatures were warmer than today. During the Little Ice Age from 1300 to 1900 AD, temperatures were cooler. Neither of these periods were caused by any human activity,” Bridenstine said. In a 2016 interview with Aerospace America, Bridenstine argued that the climate is simply always changing. Earlier this year, the congressman scrubbed some of his previous Internet history. Bridenstine’s campaign-related Facebook, YouTube and Twitter accounts have been deleted entirely, a CNN KFile review found. Several posts on the Facebook page of Bridenstine’s congressional office have also been deleted. Radio interviews and videos he was featured in were additionally removed from public view. Bridenstine joins Sam Clovis — Trump’s longtime campaign aide picked to head science at the US Department of Agriculture — as another nomination for a key science role despite having little experience in the subject. Although it is not necessary for the head of NASA to be a scientist, if confirmed, Bridenstine would be the first elected official to serve as NASA administrator. 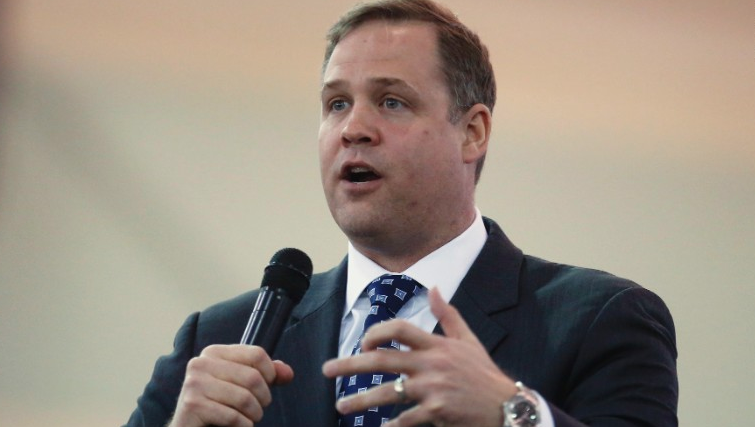 In the past, Bridenstine has expressed a personal interest in space development. Last year, he introduced the American Space Renaissance Act, which would “permanently secure the United States of America as the pre-eminent spacefaring nation,” according to a website for the bill. “Our space architectures must be resilient and our national security terrestrial systems must be interoperable with both military and commercial space systems. We must be able to deter attacks, defend government and commercial assets, and defeat threats when necessary,” it states. The bill states that NASA’s first priority should be landing a man on Mars and it would shift power from the president to Congress by creating a 21-member commission to oversee NASA.